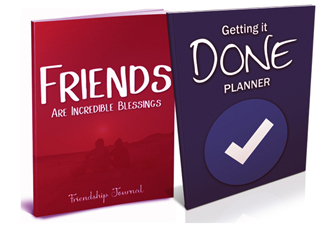 Get your FREE "Friends Journal + "Get It Done Planner"
The "Friends Journal" is a 94-page journal to help you keep your daily records organized. The "Get It Done Planner" is a 365 -page planner to keep you focused and achieve your monthly goals. and the Planner will be sent to your email. Your Journal + Planner is on the way to your inbox now!